What makes charter schools unique? Charter schools were originally formed to allow parents more input into their children’s public education, and this is true of our school as well. You can expect to contribute your ideas, time, and skills to influence the quality of your child’s learning experience in our small rural school. To be successful, a charter school requires the strong commitment of the families that make up its community. What is Muddy Creek Charter School? 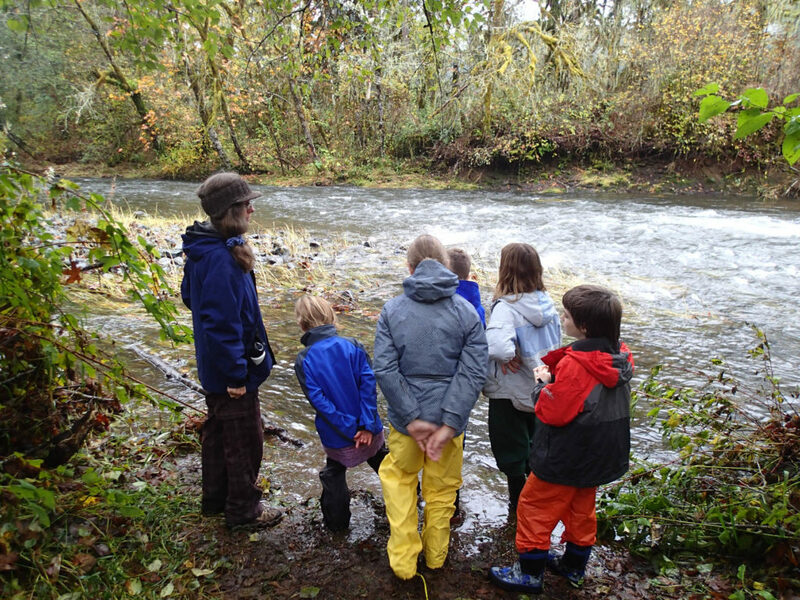 Muddy Creek is a tuition-free public K-5 school that is located at the former site of the Inavale K-8 school in the southern rural part of the Corvallis School District. It is open to all students regardless of where they live, though school size is limited per the charter. MCCS was initiated by Inavale Community Partners, Inc., a non-profit organization of local parents and community members dedicated to preserving the sustainability of the rural community previously served by the Inavale K-8 School. What do children learn at Muddy Creek? We offer a strong academic education in the context of a rural environment, the context of our Place-Based Education. Mornings focus on language arts and math, while afternoons seek to extend the academic instruction through multi-disciplinary hands-on projects encompassing the sciences, arts, humanities and technology. This is called Project-Based Education. Our natural surroundings become an extended classroom where children spend time every day in investigative learning about the roles of people and nature in sustaining life and community. How Do I Sign Up? Print and fill out the Enrollment Application Form or contact the office and one can be picked up or sent to you. Please submit the application to the office no later than March 31st to be included in the lottery for the following school year. If you are considering our school for your child, please get in touch with us, either by calling 541-752-0377 or sending us an email at office@muddycreekcharterschool.org We’ll be happy to answer any questions you may have, as well as take your contact information and arrange for you to tour the school. Can my student enroll now? Spots will be filled on a first come, first served basis. If you are interested in enrolling your child in any other grade for the remainder of this school year, you may submit an application at any time. If a spot opens up in an appropriate classroom, you will be contacted and informed if you may have that slot (if there are no other families waiting for that slot as well) or if a lottery will take place to fill the vacancy. What If My Family Doesn’t Live in the Corvallis School District? Our vision is that MCCS will provide a unique educational opportunity for families who appreciate and want to be part of a small school in a rural setting. We welcome all families; however, charter school law states that children from the sponsoring home district have priority of enrollment if we have more applicants than seats. Approval of your resident school district office is not required for application or registration, and no transfer paperwork is necessary. Does Muddy Creek offer busing? Yes, Muddy Creek has both a morning and afternoon bus route. For more information on the bus routes, click here. Does Muddy Creek have a lunch program? No, students need to bring their own lunch to school. We do offer milk everyday. What else should I be aware of? Before school care is offered and begins at 8:00am. Afterschool care is available through the Boys & Girls Club at the afternoon bus stops. For more information about these options, click here. Thank you for visiting our site to learn more about us. Please come visit us in person!